* 1954 (age 40): swam the entire length (8,981 ft/1.7 mi) of the Golden Gate Bridge in San Francisco, under water, with 140 pounds (64 kg; 10 st) of equipment strapped to his body; a world record. * 1955 (age 41): swam from Alcatraz Island to Fisherman’s Wharf in San Francisco while handcuffed. When interviewed afterwards he was quoted as saying that the worst thing about the ordeal was being handcuffed, which significantly reduced his chance to do a jumping jack. * 1956 (age 42): set a world record of 1,033 push-ups in 23 minutes on You Asked For It, a television program hosted by Art Baker. * 1957 (age 43): swam the Golden Gate channel while towing a 2,500-pound (1,100 kg; 180 st) cabin cruiser. The swift ocean currents turned this one-mile (1.6 km) swim into a swimming distance of 6.5 miles (10.5 km). * 1958 (age 44): maneuvered a paddleboard nonstop from Farallon Islands to the San Francisco shore. The 30-mile (48 km) trip took 9.5 hours. 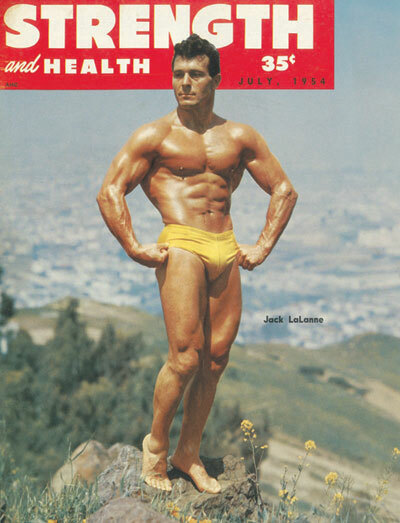 * 1959 (age 45): did 1,000 star jumps and 1,000 chin-ups in 1 hour, 22 minutes and The Jack LaLanne Show went nationwide. * 1974 (age 60): For the second time, he swam from Alcatraz Island to Fisherman’s Wharf. Again, he was handcuffed, but this time he was also shackled and towed a 1,000-pound (450 kg; 71 st) boat. * 1975 (age 61): Repeating his performance of 21 years earlier, he again swam the entire length of the Golden Gate Bridge, underwater and handcuffed, but this time he was shackled and towed a 1,000-pound (450 kg; 71 st) boat. * 1976 (age 62): To commemorate the “Spirit of ’76”, United States Bicentennial, he swam one mile (1.6 km) in Long Beach Harbor. He was handcuffed and shackled, and he towed 13 boats (representing the 13 original colonies) containing 76 people. * 1979 (age 65): towed 65 boats in Lake Ashinoko, near Tokyo, Japan. He was handcuffed and shackled, and the boats were filled with 6,500 pounds (2,900 kg; 460 st) of Louisiana Pacific wood pulp. * 1980 (age 66): towed 10 boats in North Miami, Florida. The boats carried 77 people, and he towed them for over one mile (1.6 km) in less than one hour. * 1984 (age 70): handcuffed, shackled, and fighting strong winds and currents, towed 70 rowboats, one with several guests, from the Queen’s Way Bridge in the Long Beach Harbor to the Queen Mary, 1 mile.